Matthew Waxman took home the Season XVI Tournament of Champions event on Saturday night in Las Vegas. Darren Elias was the headliner Saturday night in Las Vegas as the World Poker Tour Tournament of Champions played down to a winner. 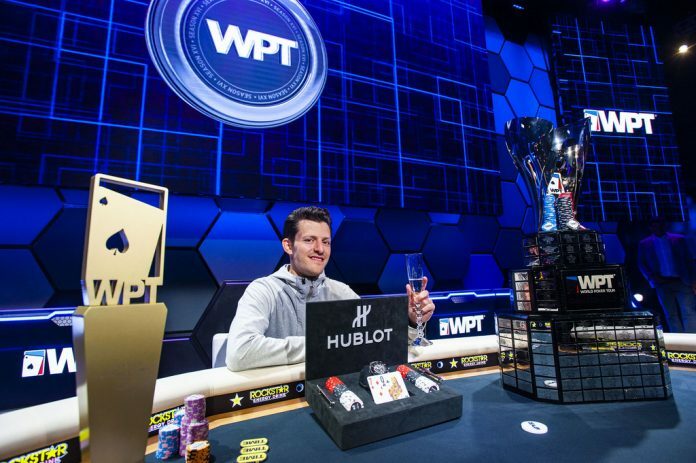 Just days after winning his record-setting fourth WPT title, Elias entered the TOC final table with the chip lead and a chance at going back-to-back against some of the toughest fields in WPT history. Matthew Waxman wasn’t thinking about that narrative though and after eliminating Elias in third place, had little trouble cruising to victory to capture the TOC and the $463,375 first-place prize money at the Esports Arena at the Luxor Las Vegas. After a double-elimination on the final hand of Day 2, only five players returned for Saturday. With blinds at 8,000/16,000 (8,000) Elias raised to 35,000 from the cutoff before Nick Schulman moved all in for 438,000 from the small blind. Elias called and turned over which put him ahead of Schulman’s . The flop put Schulman in the lead but only briefly as the hit the turn. The river was the sending Schulman out in fifth place. Another 22 hands later and Elias, who began the day with the chip lead, was picking up another elimination thanks to fortuitous turn card. David Benyamine moved all in for 370,000 from the small blind and Elias called from the big. Benyamine showed while Elias found he was behind with . The flop changed nothing but the turn moved Elias ahead. The river was the and Benyamine was out in fourth place. Any momentum that Elias had built up was erased in hand with Waxman that saw Elias queens outrun by Waxman’s jacks, doubling up Waxman and leaving Elias reeling. It wasn’t long before Elias’ run at back-to-back victories was snuffed out. Matas Cimbolas raised to 50,000 from the button and Elias moved all in the small blind for 645,000. Cimbolas called and showed while Elias was drawing live with . The board ran out to give Matas top pair and eliminate four-time WPT champion Elias in third place. Waxman began heads-up play with a 2-1 lead over Cimbolas and he never surrendered it, eliminating his Lithuanian opponent after 38 hands of play. Cimbolas completed from the small blind and Waxman checked to see a flop of . Waxman check-called Cimbolas’ bet of 40,000. The turn was the and Waxman check-called again, this time for 125,000. The river was the and Waxman checked again. Cimbolas moved all in for 425,000. Waxman used one of this time extension before announcing a call. Cimbolas showed and Waxman happily tabled for second pair, good enough to win the pot and eliminate Cimbolas. The event, which allows champions from previous seasons to buy-in for $15,000 while Season XVI earned their entry by winning a WPT title, attracted a record-setting 80 players. This was the first year the event was played in Las Vegas after spending the previous two years at the Seminole Hard Rock in Hollywood, Florida.